Please select options for the report to export. To invite others to work on this portfolio with you, insert emails below. Unless your portfolio is published, only those you invite to collaborate can access this portfolio. Please separate emails with commas. This field is not editable for dynamic portfolio. Note: Original portfolio is still unpublished. So, you cannot subscribe to it. Please separate words or phrases with commas. 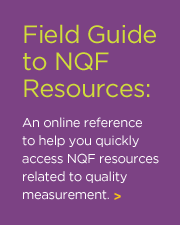 NQF seeks comments on your experience using measures. This information will inform NQF's processes and projects, including the measure maintenance review process and deliberations of the Measure Applications Partnership (MAP). Is this Comment on behalf of another person or organization? 2. For what purpose are you using this measure? 3. Why are you using this measure (e.g., required by program, meets organizational priorities, aligns with other reporting programs, data sources)? 4. Have you encountered challenges while implementing this measure (e.g., with specifications, obtaining data, lack of harmonization, interpreting results)? 4A. If yes, please provide additional details. 5. Given the value of this measure to your organization, do you consider it overly burdensome to implement? If yes, please provide any suggestions on how to reduce the burden of using this measure. 6. In order to implement this measure, did you change or adapt the specifications? 6A. If yes, what did you change or adapt and why? 7. What change in performance or health outcomes have you seen since using this measure? 7A. Please provide additional details on any changes in performance or health outcomes. 8. Please provide any additional feedback on this measure. 9. Are you willing for NQF to follow-up with you? If so, please provide your contact information. After a measure has been endorsed by NQF, any party may file an appeal of the endorsement decision with the NQF Board of Directors. An appeal of an endorsed measure must be filed within 30 days of the endorsement decision and must include written evidence that the appellant’s interests are directly and materially affected by the consensus standard or sets of standards recently endorsed by NQF, and that NQF’s endorsement of this standard has had, or will have, an adverse effect on those interests. Is this Appeal Request on behalf of another person or organization? A maximum of 1000 characters are allowed. File size can not be more than 10MB. An Ad-Hoc review may be conducted on an endorsed measure, practice, or event at any time with adequate justification to substantiate the review. Requests for Ad-Hoc reviews will be considered by NQF on a case-by-case basis and must be justified by specific criteria. Ad-Hoc reviews can be requested at any time by any party, and requester(s) should indicate under which criterion they are requesting the Ad-Hoc review and submit adequate evidence to justify the review. Is this Ad-Hoc Review Request on behalf of another person or organization? NQF Disclaimer: Measures may be used for non-commercial implementation and/or reporting of performance data. Contact the Measure Steward if you wish to use the measure for another purpose. NQF is not responsible for the application or outcomes of measures. NQF Portfolio Disclaimer: The ability to create measure portfolios is intended to allow QPS users to share information regarding measure use. NQF does not endorse measure portfolios created in QPS. If you click Find Measures, you will lose your current search results. CPT® only copyright 2004-2019 American Medical Association. All rights reserved. The five character codes and descriptors included in the Measure(s) are from Current Procedural Terminology (CPT®), copyright 2004-2019 by the American Medical Association (AMA). Use of CPT® in Measure(s) including CPT is limited to Non-Commercial Use. Any commercial use of CPT beyond fair use requires a license from the AMA. Commercial use is defined as the sale, license or distribution of the Measure(s), including CPT, for commercial gain, or incorporation of the Measure(s), including CPT, into a product or service that is sold, licensed or distributed for commercial gain. CPT is provided “AS IS” without any liability to the AMA of any kind. The responsibility for the content of these Measures is with the Measure steward or Measure developer and no endorsement by the AMA is intended or should be implied. The AMA disclaims responsibility for any liability attributable or related to any use, nonuse or interpretation of information contained in this Measure, including CPT. The AMA does not practice medicine. The AMA assumes no liability for data contained or not contained herein. Any use of CPT should refer to the most current CPT publication. Applicable FARS/DFARS Restrictions apply to U.S. Government Use. In order to access some features of QPS, such as portfolio creation, you must create an NQF website account. You are solely responsible for the activity that occurs on your account and for keeping your password secure. You must notify NQF immediately of any breach of security or unauthorized use of your account by contacting info@qualityforum.org. QPS consists of software that is designed to allow you to access health care quality measures and related information. You agree that you will not engage in any activity that interferes with or disrupts QPS. You agree that you will not reproduce, duplicate, copy, sell, trade, or resell QPS, in whole or in part, for any purpose. You may not and you may not permit anyone else to copy, modify, create a derivative work of, reverse engineer, decompile or otherwise attempt to extract the source code of QPS or any part thereof. You agree not to access or attempt to access QPS by any means other than through the interface that is provided by NQF, unless you have been specifically allowed to do so in a separate agreement with NQF. You specifically agree not to access or attempt to access QPS through any automated means (including use of scripts or web crawlers) and shall ensure that you comply with the instructions set out in any robots.txt file present in QPS. Information in QPS is compiled and published by the National Quality Forum (“NQF”) as a reference for information regarding health care quality measures endorsed by NQF. QPS users also have the ability to create content, such as measure portfolios (collectively, “User-Generated Content”), which may be shared with other QPS users. Measures and related information (collectively, the “Measures Content”) may only be used for non-commercial implementation and/or reporting of performance data. Measures Content regarding a specific measure may be protected by intellectual property rights which are owned by a Measure Steward that provides the Measures Content to NQF. You may not modify, rent, lease, loan, sell, distribute or create derivative works based on that specific Measures Content, in whole or in part, unless the Measure Steward associated with that Measures Content has specifically given you permission to do so. You should contact the appropriate Measure Steward if you wish to use the specific Measures Content for a purpose other than non-commercial implementation and/or reporting of performance data. Measures Content does not include User-Generated Content and User-Generated Content does not include Measures Content. “Measures Content” and “User-Generated Content” constitute “Content,” collectively. Content may include hyperlinks to other web sites or resources. NQF has no control over, or responsibility for, third party websites or the information contained in those websites. You agree that you shall not remove, obscure, or alter any proprietary rights notices (including copyright and trademark notices) which may be affixed to or contained within the Content. Such proprietary rights notices may be affixed to the Content by NQF or by the Measure Steward. Users retain copyright and any other rights already held in User-Generated Content which submitted, posted, or displayed on or through QPS. By submitting, posting or displaying User-Generated Content, you give NQF a perpetual, irrevocable, worldwide, royalty-free, and non-exclusive license to reproduce, adapt, modify, translate, publish, publicly display and distribute any User-Generated Content which you submit, post, or display on or through QPS. This license is for the sole purpose of enabling NQF to display, distribute and promote QPS. Defects in the operation or functionality of QPS will be corrected. Deletion of, corruption of, or failure to store, measure portfolios or comments. Please copy widget code to add Portfolio(s) in your site. Applicable for published Portfolio(s) only. Please copy widget code to add Measure(s) in your site.